Any help would be great as I am completely stuck. 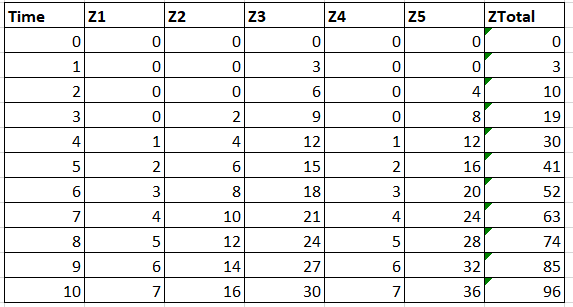 I am trying to create a table/array/structure (whatever is best for this) based on 2 variables X&Y if a certain condition is met and plot a time vs Z value. If the value of X(1) is greater than Time then add the value of Y(1) - linear growth after Time goes past the X value. Then I want it to loop to get Z(2) and so on. Sorry if that is badly explained but the table below is the output I am looking for. Thanks for the response. Even though this was the exact table I was looking for its not really what I am trying to achieve. I am trying to plot time vs Z value from 0-(the amount of time to hit Z max). (these variables will be different for each study, just using them as an example of what I am trying to achieve). The value of Z then depends on when time is greater or equal to the x value. 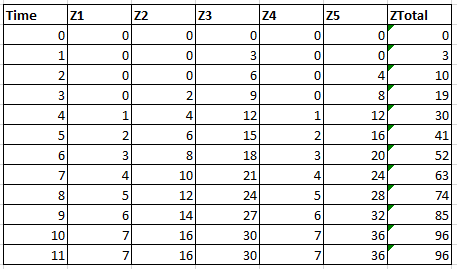 if it is greater then Z starts populating by the y value. in the loop I am trying to calculate all Z values until the Ztotal value >=Zmax. you can see z3=3 for this. This is because the x value is now >= time. if x(3)>time then starting poltting y values. I can do this by writing a really long code but think it could be acieved in a few lines of code in a loop (just cant figure it out). After time=10 the Zmax value of 96 is hit. I want to loop to stop here. Hopefully this is explanied a bit better and I really appreciate your help so far.